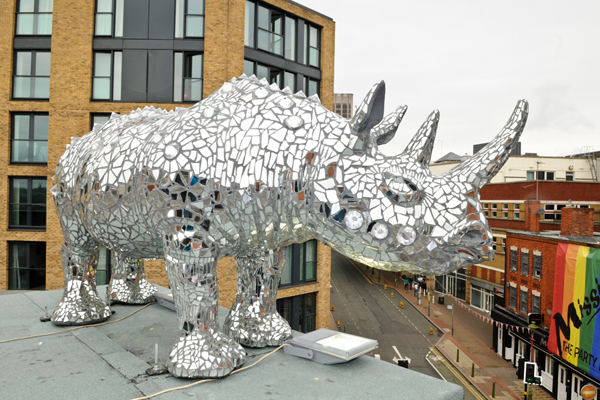 The Rhino sculpture was a commission by Birmingham Southside and Birmingham LGBT . The Rhino is a permanent sculpture marking the gateway to the Gay Village area. It was installed on the Wynmer building in Birmingham in June 2012 by Artists Robbie Coleman, Em Butler and Vik Litton. The Heart of the Rhino was a companion project. Messages, photos, music and video were collected from the LGBT community and put together in a heart which is sealed inside the Rhino.